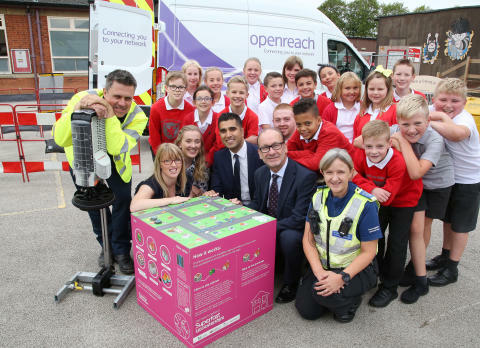 Primary school children in Melton Mowbray were the first in Leicestershire to try out a new learning resource developed by the county council which explains how fibre broadband works. The new learning tool, known as ‘the interactive cube’ was developed by the Superfast Leicestershire team to teach children how the internet reaches their homes and broaden the knowledge of youngsters around STEM (Science, Technology, Engineering and Maths) skills. The Superfast Leicestershire interactive cube aims to help Leicestershire children bridge this gap. Through building their own fibre broadband network and connecting all the towns and villages, children can learn about the engineering behind the delivery and installation of fibre broadband. The group of Year 6 pupils, at Brownlow Primary School in Melton, spent the morning learning how fibre broadband travels from their local telephone exchange into their homes, enabling them to use the internet for learning, as well as enjoying popular apps such as YouTube and Netflix. Alongside the technical side pupils also learnt about the safety aspects of using broadband from a representative from Leicestershire Police force, who are at the forefront of the drive to raise awareness of the dangers of living in an increasing digital world. The new interactive learning cube is 60cm cubed and features a magnetic surface which is designed to look like a map of a local village. Buildings that are familiar to children such as libraries and shops have been included alongside homes, farms and telephone exchange points so they can see how the main fibre network or spine is so important to the project. Information on how it all works is included on the sides, along with an information key and a suggested game to play. Superfast Leicestershire is playing a leading role in making faster broadband available in rural areas - already reaching more than 70,000 homes and businesses across the county since the first broadband cabinet went live in 2014. More than 94 per cent of premises across the Borough of Melton now have access to superfast broadband. A typical Melton home, covered by the Superfast Leicestershire programme, can now download a HD YouTube clip in less than eight seconds, compared to around two minutes previously. Or a two hour HD movie in four minutes, compared to around an hour.